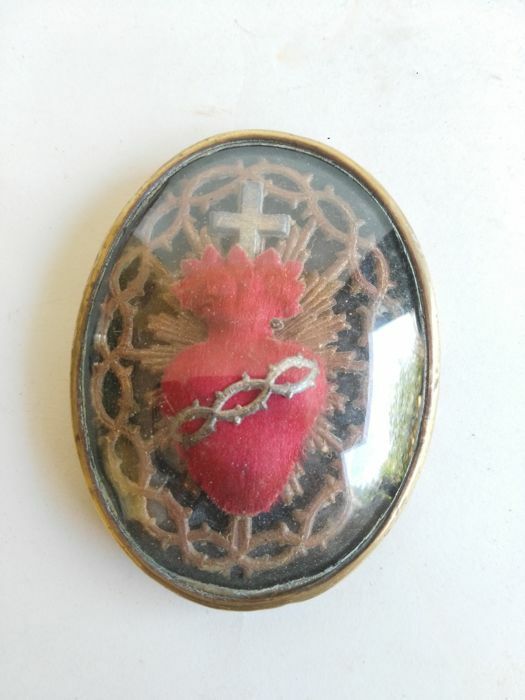 Antique relic framed in glass case with Bronze Finishing, with cross, heart and crown of thorns inside.Sized 6.5 x 5 cm. In good condition, with small chips due to ageingPlease, look at the pictures that are integral part of the description. Shipping via international TNT courier, with delivery updates. Please, read carefully: due to logistic reasons, the purchased items cannot be picked up but only shipped. Before any purchase, please look carefully at the photos which are an integral part of the description and check the shipping costs in order to avoid future claims, as per European rules on internet sales.